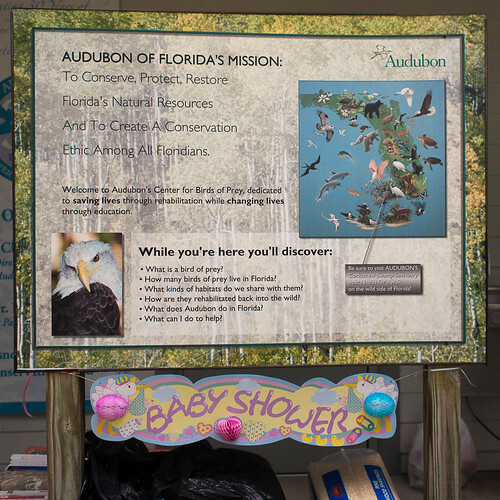 May is the time of year year for the Audubon Center for Birds of Prey to hold its annual baby owl shower (http://fl.audubon.org/baby-owl-shower). The center was packed with visitors on Saturday, and a lot of supplies were donated, such that they were stacked everywhere around the entrance. 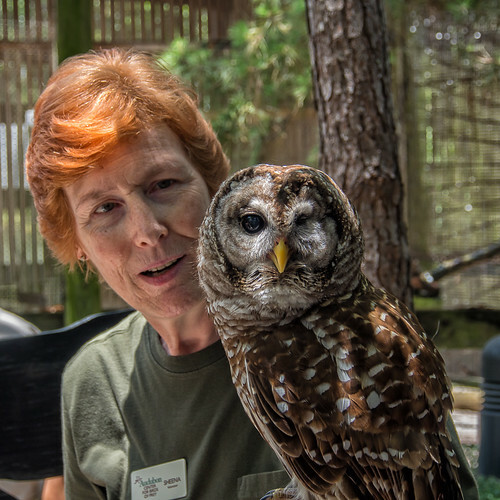 It’s good to see this kind of positive response, and I hope it keeps up; feeding and caring for the raptors is an important ongoing task. 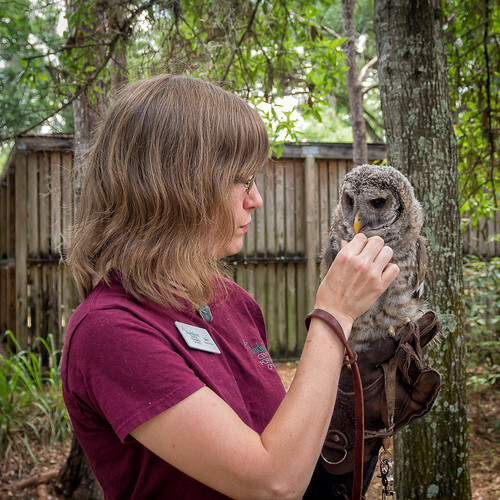 The Center holds far more than just the owls, but today was their special day, especially the juvenile barred owl who was molting and loosing its “baby” feathers. 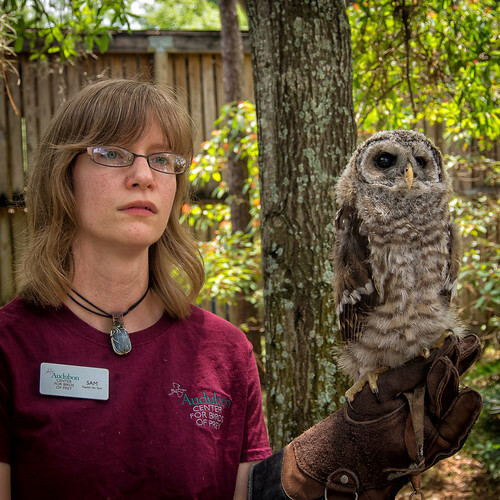 The idea of bringing out real owl chicks is a bit concerning; the juvenile is almost as big as an adult (my untrained eyes couldn’t see a real difference except in the feathers) and was big enough to handle lots of folks standing around her. Yes, I have three cats, and love them, and look after them. But I’m a responsible cat owner, keeping them indoors and spaying them when they were kittens. I’ve seen too many feral cats in and around where I live and work, and I’ve heard the occasional owl call (along with hawks hunting for the rats still living and breeding in abandoned orange grove remnants). 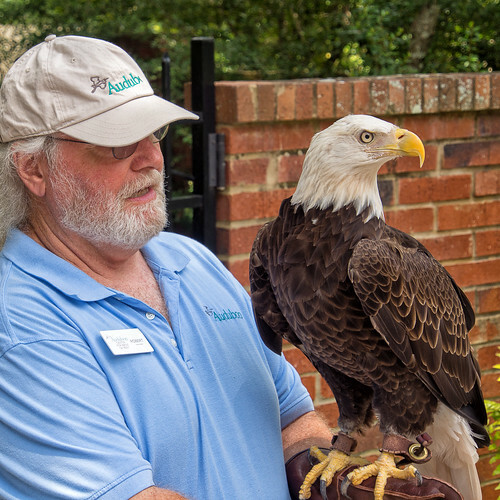 It’s a cruel thing to say, but we’ve so taken over raptor habitat and allowed our pets to breed indiscriminately. Between our abundant garbage and our abundantly breeding pets, we’ve provided substitutes for may formerly wild creatures such as the raptors. What did you expect nature to do but adapt?